"One of the greatest musical traditions in Ireland is thta which belongs to the 200 square miles in East Kerry and North-East Cork– situated roughly between the four towns of kanturk, Castleisland, Killarney and Millstreet and known as Sliabh Luachra– the home of some of the finest traditional music we are ever likely to hear. The music of Sliabh Luachra has a number of unique features: its lively rythms and the lovely warm style in which it is played; the dance tunes known as slides and polkas, which are found in no other part of the country and the many good musicians who played them down the years. One of the most famous musician was the late Pádraig O'Keeffe – "The last of the fiddle masters"– A school teacher from Glountane, Cordal near Castleisland, who died February 22, 1963 and whose legendary playing was a very strong influence on his fellow musicians and on the music of the region where he lived." He is also famous for his way of tuning his fiddle: "Pint, Please, Thank You" spoken while sounding the four open strings of the fiddle (EADG)! 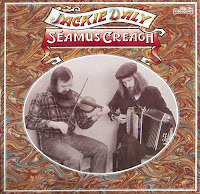 I have not since then heard anything about these two local lads (Jackie and Séamus) and couldn't find anything on the web about them. Feel free to drop a line the comments if you know anything. What foine players they were! Get your jigs, slides and polkas here. Don't forget: without Irish music, you wouldn't Apalachian music, without Apalachian you don't get Country and without Country lashed with a good deal of Blues, there is no rock 'n' Roll: hence NO Garage! I'm sorry to tell you the very sad news that Séamus Creagh died on 15 March 2009. He will be sorely missed for many reasons. A musical, friendly, jovial, gentle man is gone.